Forex quotes are displayed as the last price traded for a currency pair and that currency pair’s bid and ask price. This is similar to a stock equity quote where a company’s stock price is listed on a particular trading exchange (i.e., NYSE, NASDAQ, AMEX, etc.) with its bid and ask price. 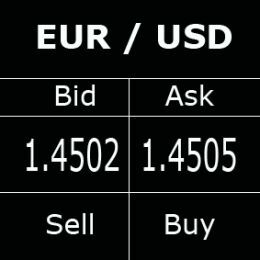 For a long position, where you purchase the currency pair with the expectation that the price will increase the bid price is often referred to as the buy price and the ask is the sell or offer price. For a Forex quote the difference between the bid (buy) price and ask (sell) price at any moment is called the spread. For example, if the bid price is 1.3298 and the ask price is 1.3303 then the spread would be 5 and represents 5 PIPs. The spread is what the broker keeps as compensation for placing your trades. When purchasing currency the Forex broker places your trade at the ask price and gives it to you at that sell price. The larger the spread the more you pay the broker and reduce your net profit. When there is low volume (fewer participants trading) the spread is generally larger. The broker always makes money from your Forex trading by a small mark-up of the spread for a cross-currency (paired currency). Some broker and dealer mark-up is larger than others and should be a consideration when choosing a broker. Webster’s dictionary defines a PIP as, “A small seed as of an apple.” In Forex a pip is a “percentage in point” movement of the value of one currency relative to another. A PIP is the basis of measurement for movement of currency value. Currency pairs are predefined, they are also called cross-currencies. There are over 70 currency pairs defined. Many currency pairs do not have enough volume for retail trading. Their volume is only inter-bank currency exchange for the purpose of money conversion of one country currency into another country currency. It results from commerce and commercial business activity between the two countries. A price quote of a currency pair quantifies the value of one currency relative to another as a single number. To determine the value of two currencies that are not defined as a cross-currency pair one or more intermediate currency pairs can be utilized as a chained relationship. Currency conversion valuation is the basis of all money exchange. The volume of currency conversion is very large for the majors. They are liquid world currencies and suitable for retail money trading. The first currency of a currency pair is the base. The second currency of a currency pair is the quote or counter. If referencing the EUR/USD, EUR is the base and USD is the quote or counter. The base is always parity with a value of one. It is the counter which is equated to the base. Therefore, X counter currency is equal to 1 base currency. For the EURUSD the EURO dollar is equal to 1. A variable amount of US dollars equates to 1 EURO. All Forex trading market currency quotes are constructed in this manner, however some currencies use a multiplier, as in the USDJPY, due to the vast difference of values. In these situations the counter currency can represent a thousand or or similar 10’s multiple to equate the currencies. This is why some cross currency Forex quotes like the USDJPY look different than others (i.e., 75.368). Currency is quoted as Cross Rates by Forex Quote Brokers and Forex Quote Dealers. This is how the pricing is presented on electronic trading platforms. It is the amount of foreign currency that can be purchased by one U.S Dollar. The U.S. Dollar (and the EURO) is considered a conversion currency by International Banking. International Banking is where the Dealers who provide currencies for trading actually transact our buy and sell Forex Trading requests reside. The Dealers compete to provide the money we are trading. An Exchange Rate is how the cost of items is determined when one company purchases products or services from another company and they do not reside in the same country. It is a daily rate for currency conversion. The currency of the company purchasing must pay the company providing goods or services using the conversion currency of the country that is providing. The currency of one country must be converted to the currency of the other country. The Currency Exchange Rate method is also how credit card purchases for items outside of the card holder’s country would transact, even if the cardholder makes the purchase while visiting that other country. Conversion Currency has a broad context. Sometimes the currency of one country can not directly convert to that of another country. When this happens the amount must go between an intermediary country that has conversion currency with both countries to complete the transaction. The U.S. Dollar and the EURO are considered conversion currencies by International Banking. Both currencies are able to directly convert into many other national currencies.